Bombardier Commercial Aircraft announced today that its all-new C Series aircraft program has begun the ramp-up to full production. The final assembly facility is fully equipped and production is progressing according to plan with aircraft in various stages of the build sequence. Additionally, Bombardier also confirmed that the CS100 aircraft that is scheduled to be delivered to first operator SWISS International Air Lines (SWISS) and enter service in Q2 2016 is structurally complete. Yesterday, SWISS’ flight crews kicked off their CS100 aircraft flight training in Mirabel, Québec where they will undergo intensive training to prepare for the route-proving flights they will operate alongside Bombardier’s flight crew when the CS100 route-proving aircraft flies to Europe in the coming weeks. This follows the completion of the North American route-proving program that included more than 35 cities. During the program, the CS100 aircraft conducted flights using typical airline flight routings and operational procedures. In December 2015, Bombardier announced that the CS100 aircraft had received its Type Certificate from Transport Canada. 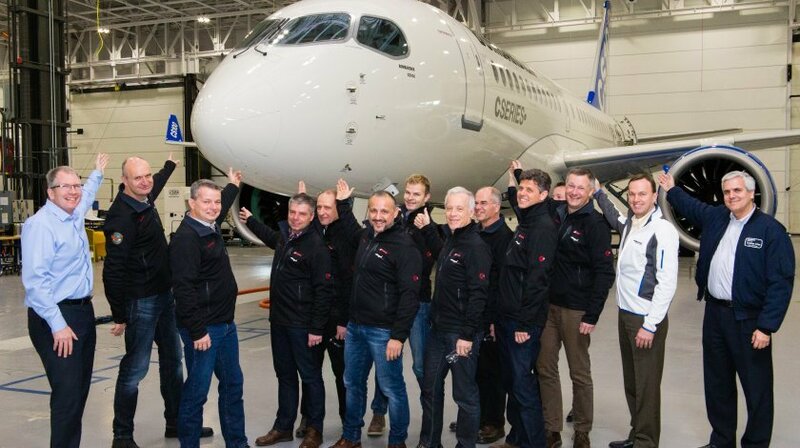 Bombardier’s CS300 aircraft, the larger model, is on track to obtain its Type Certificate within the next six months as planned. Bombardier will continue to work with Transport Canada to validate the CS100 aircraft’s training syllabus. All noise performance testing on the CS100 aircraft has been completed and data confirms it is the quietest in-production commercial jet in its class. The aircraft’s noise performance and its outstanding short-field capability make it ideal for varied types of operations. The C Series aircraft’s maximum range has also been confirmed to be up to 3,300 NM (6,112 km), some 350 NM (648 km) more than originally targeted.